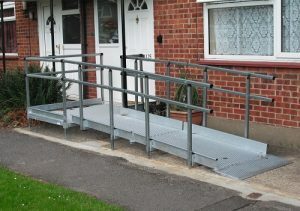 If a flexible access solution is what you need, a modular ramp system may do just the trick. Whether it’s for a short-term project or a space where an off-the-shelf solution won’t cut it, modular systems can rise to the challenge. Modular systems are strong and durable and can be used as permanent constructions. However, they are also simple to set up and easy to disassemble and store as needed, making them ideal for short-term installations. The modular components can navigate all kinds of settings, including large areas, difficult angles and obstructions. 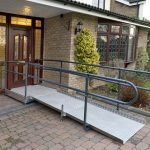 With the addition of platforms, modular wheelchair ramps ensure you have safe landing points with sufficient flat levels for entry and exit. 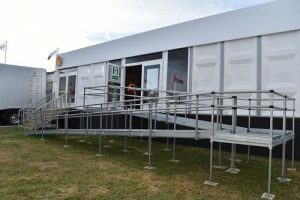 Entrance point: bespoke modular system with double handrails. Residential entrance ramp with handrails both sides. 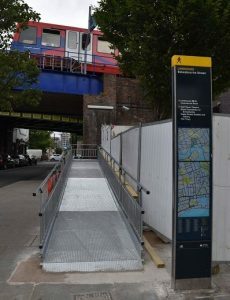 Temporary access ramp at construction project with double handrails. Got an Access Challenge That Need Solving? Talk to one of our ramp experts today – we offer a free site survey so we can assess your needs. All modular systems are tailormade to fit your site perfectly. We’ll consider sizing as well as load capacity, ground type and surface requirements. You’re in safe hands with RAMPCO. Our specialist team can take care of your project from start to finish. Talk to one of our ramp experts about your project today on: +44 (0) 1920 823940.